By Rob Caswell and Mark Dickson, with additional info and photos supplied by Chris Trice and Darren Peters. The seventies were a relatively dark period for TV SF. 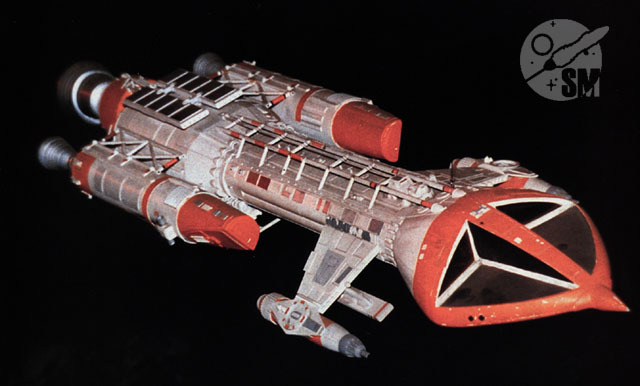 Gerry Anderson's Space: 1999 was the the tube's first major planet-hopping adventure series since Star Trek. 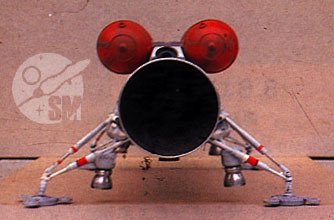 Running for two seasons, from '75 to '77, the show introduced us to a tremendous variety of interesting spacecraft, modeled primarily by Martin Bower. Certainly the most notable and enduring of these is Moonbase Alpha's workhorse, the Eagle, which was created by Brian Johnson. While the Eagle's unstreamlined design made its travelling to and entering a different planet's atmosphere each week seem implausible, the craft is an elegant design in the context of its intended role: a utility vehicle for lunar operations. 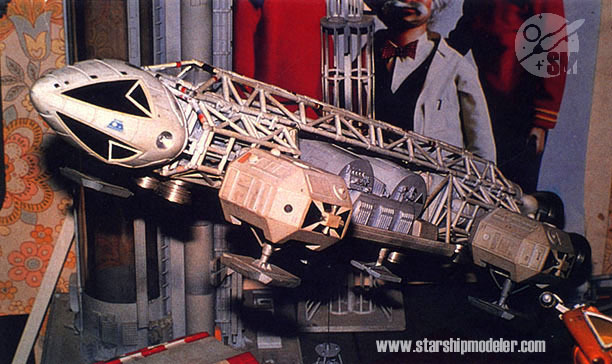 The Eagle was designed to be modular so it could undertake a great variety of roles. Its center section could be swapped out with mission-specific pods. 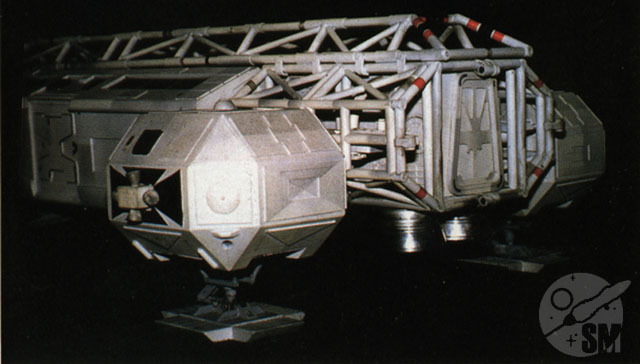 The main pod varieties included transporter (passenger, rescue, and recon), docking/science, winch, and cargo. 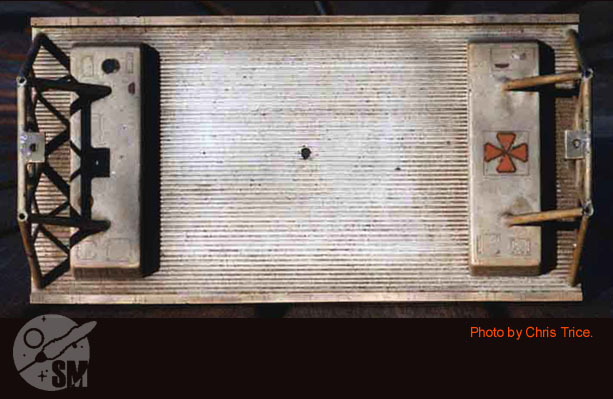 A number of studio models existed for the Eagles, in various sizes - 44" and 22" being the most common. Wherever possible we have noted which model a set of pictures depicts. There were minor detail variations between all the models. . Image 1: Side view. The landing pads are tilted backward due to gravity (the picture's rotated 90 degrees). Image 4: Back view, looking straight into the engine bells. 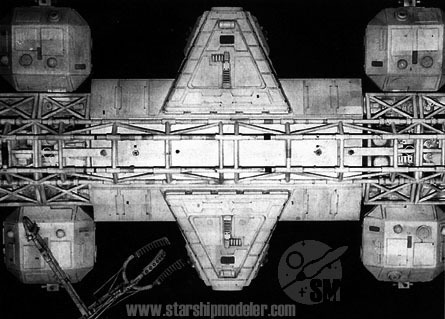 Image 5: A crisp look at a 44" transporter Eagle with the Command Module removed. 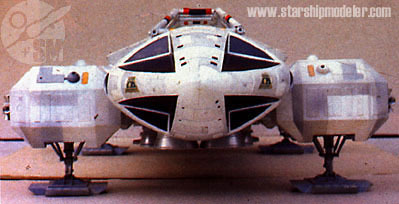 The most common flavor of Eagle pod was the Transporter. 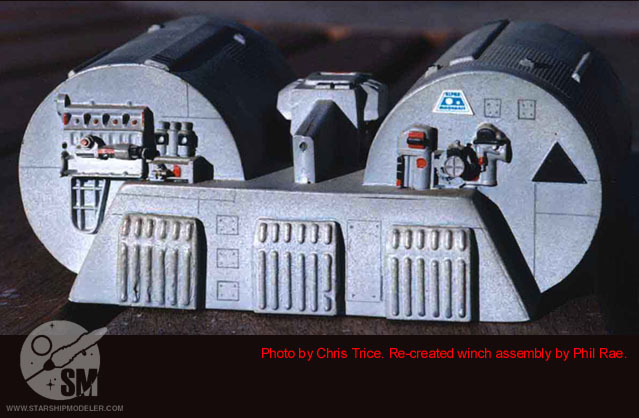 Space:1999 lore goes on to say there were Passenger, Recon, VIP, and Rescue pods, but all of these are (for modeling purposes) just the standard Transporter pod - sometimes painted with different markings, such as red stripes for the Rescue pod. The images below are of a 44" Eagle reproduction built by Martin Bower, with several pieces obtained from Phil Rae and D. Meddings. While not an authoritative reference for paint/markings, especially since only the command pod may actually have been filmed, it does provide excellent detail references for the modeler. Images courtesy of Darren Peters. Image 6: Close-up, engine structures. Image 7: Top/side, looking back toward the engine assembly. 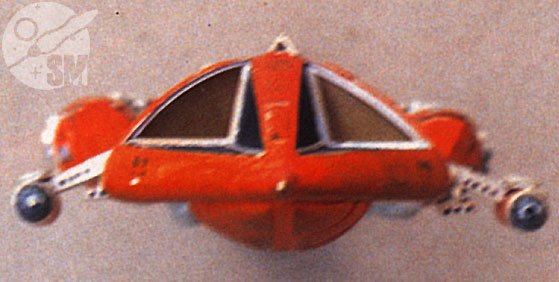 The square, ridged surface detail visible on the forward landing pod was not seen on the studio models. Image 8: Close-up, command pod (left side). This has apparently been puttied and repainted since used to film a crash scene. 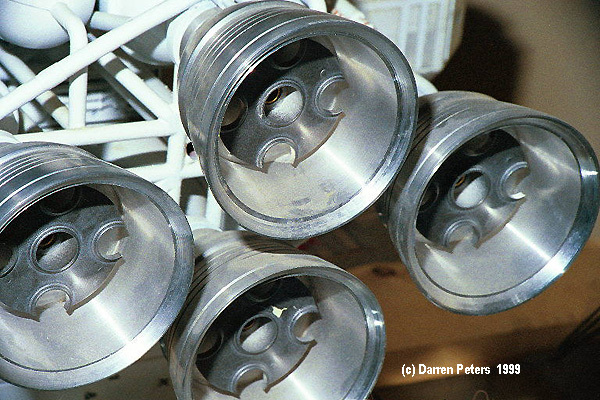 Image 9: Close-up, inside main engine bells. Image 10: Side view, entire model. Image 12: Close-up, inside the "cage". 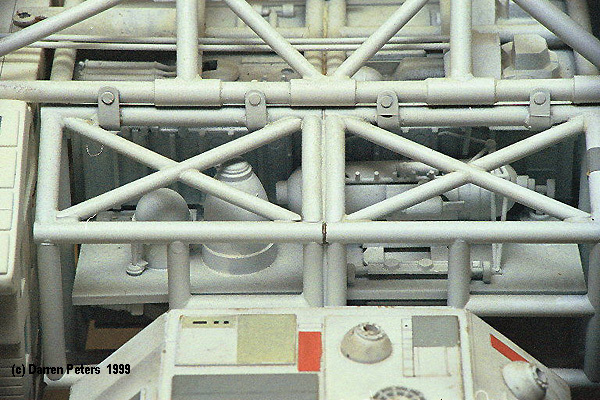 The flat, circular baffle-like structure at the bottom of the picture was not seen on studio models. In it's place was a flat disk, which can be seen in Image 7. Image 1: A three quarter view from the front. This is the model as it appeared in an Anderson exhibit. 22" model. Image 2: Top view of the full Eagle with winch assembly. 22" model. Image 3: Side view with winch. 22" model. 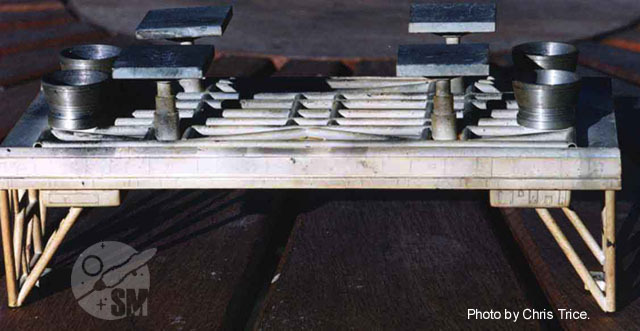 Image 4: Close up of the winch assembly, as recreated by Phil Rae. 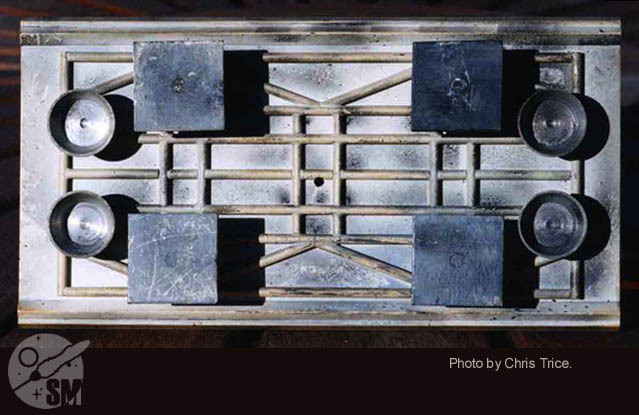 Image 5: Top view of the cargo pallet. Image 6: Side-bottom view of cargo pallet. 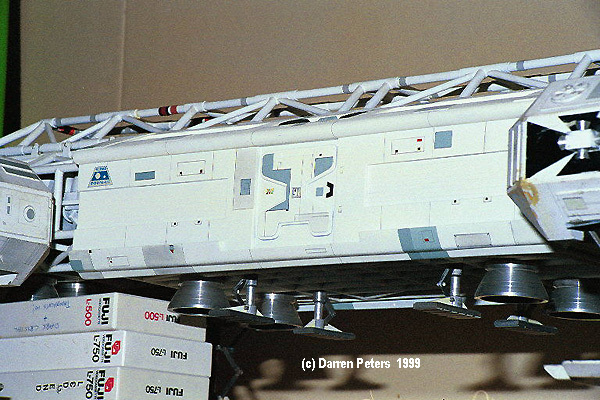 Image 7: Bottom view of cargo pod. 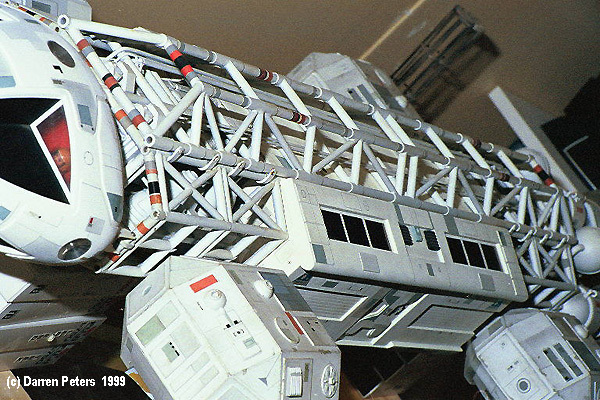 Image 8: End view of cargo pod. In the first episode, Breakaway, we saw this Eagle type at the beginning and end of the show. It's seen in the teaser, unloading canisters of nuclear waste, then we see it later outfitted with a winch as Alpha's Eagle fleet rushed to disperse the nuclear waste dump's canisters about the lunar surface. 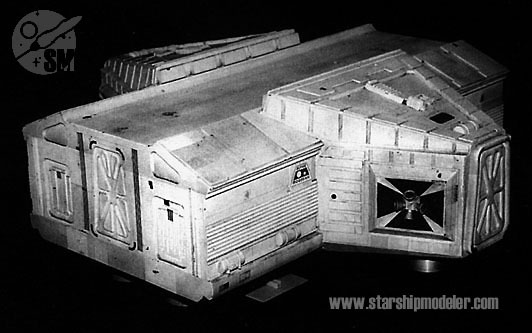 All that remains of the original Cargo Eagle model is the cargo pallet shown in these pictures. Image 1: B&W side view of the science pod. 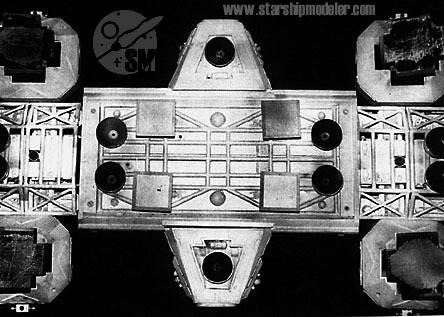 Image 2: B&W three-quarter view of a science pod detached from the Eagle. Show excellent detail on the ends - the passenger and support systems access area. Image 3: B&W bottom view of the pod, locked into an Eagle. 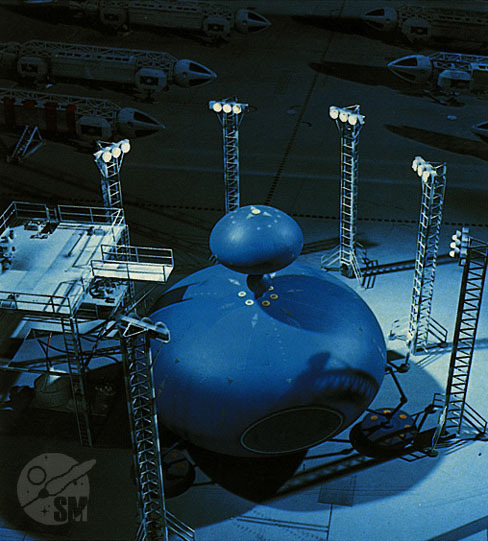 The pod's larger-sized landing pads are clearly visible. 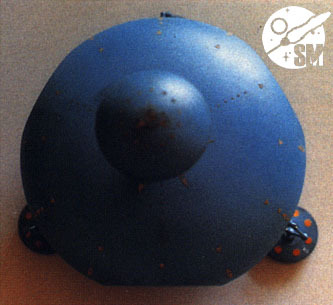 Image 4: A 44" science pod-mounted Eagle with the front of the command module removed, exposing the pilot figures and interior lighting systems. Image 5: Another shot of the 44" Eagle outfitted with the science pod - three quarter front view. This was one of the first season models. 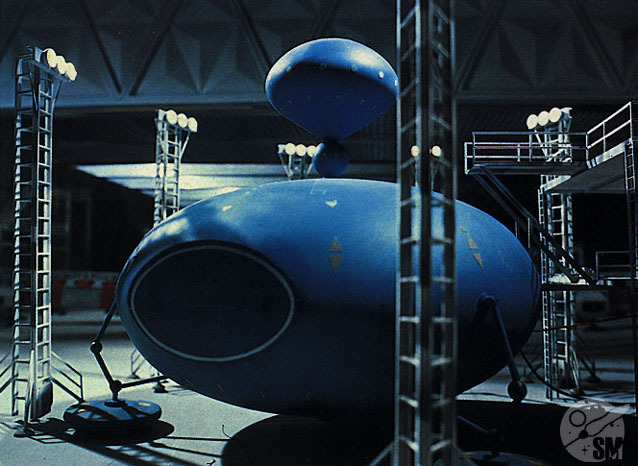 This pod was one of the most distinctive seen throughout the series. Two projections capped with airlock doors jut from its side. 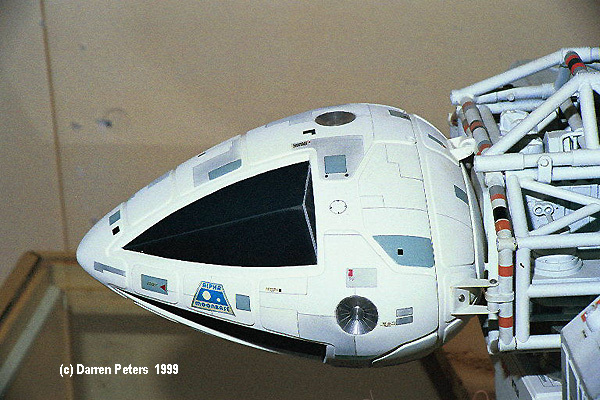 While its function as a docking vehicle seem obvious, this pod is usually referred to as a "lab" or "science" module. Supposedly this pod carries advanced survey equipment and is designed to be dropped in research locations for extended durations. Image 1: A B&W top view of an Eagle with the grab arm. The Eagle sports a lab pod. In the episode, The Exiles, an Eagle is sent out to retrieve some alien "pods" that are floating by. The Eagle is outfitted with a grab arm that sits atop one of its landing gear/RCS housings. Once grabbed, the arm maintains its hold and the alien artifact is returned to one of Alpha's remote research facilities. 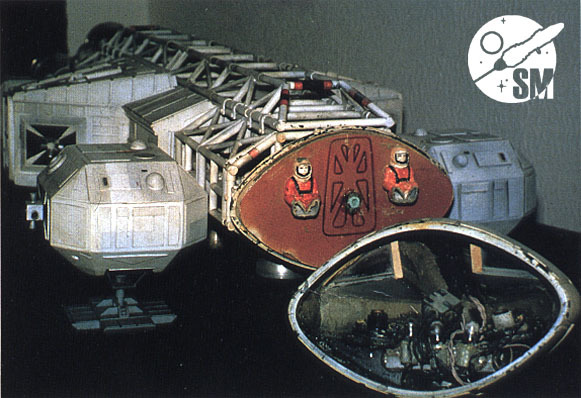 This is the only time this arm was used for this purpose, though a similar one is used in another episode to deliver a refueling pod to an Eagle. 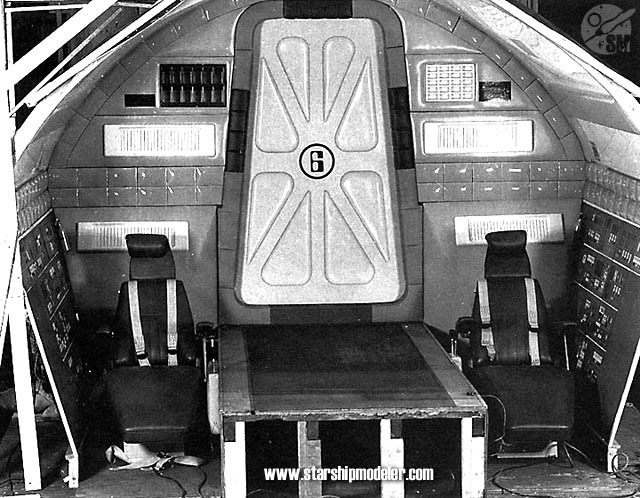 Image 1: A B&W picture of the Eagle cockpit set, looking straight in from the front. The Eagle's two man cockpit was housed in the Command Module at the front of the craft. Generally the pilot occupied the port seating position. Image 1: Top view of smaller Hawk. Image 2: Bottom view of smaller Hawk. 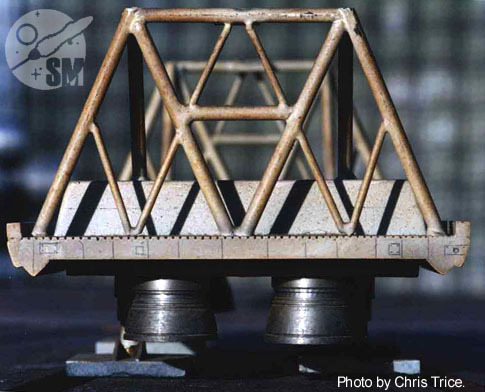 Image 3: Nose-on view of smaller model. Image 4: Rather dark picture looking into the engine bells. Image 5: A clear three-quarter view of the larger model. 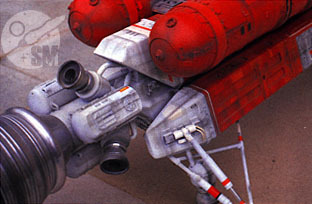 Only appearing in one episode, War Games, the Hawk is easily one of the favorite designs from 1999. With an obvious family resemblance to the Eagles, Hawks are Earth ships which are optimized for space warfare. There were three sizes of Hawks built: about 31", 15", and 7". Our pictures include several views of the larger model (1/24th scale). 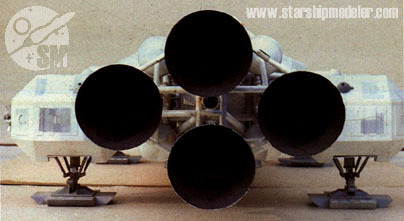 Image 2: Bottom view of Swift. 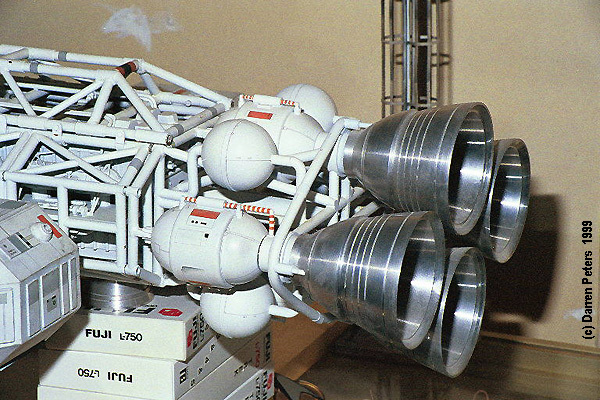 Image 5: Very nice three quarter view of the studio model with a lunar buggy next to it for scale. Image 6: Close up of engine area. 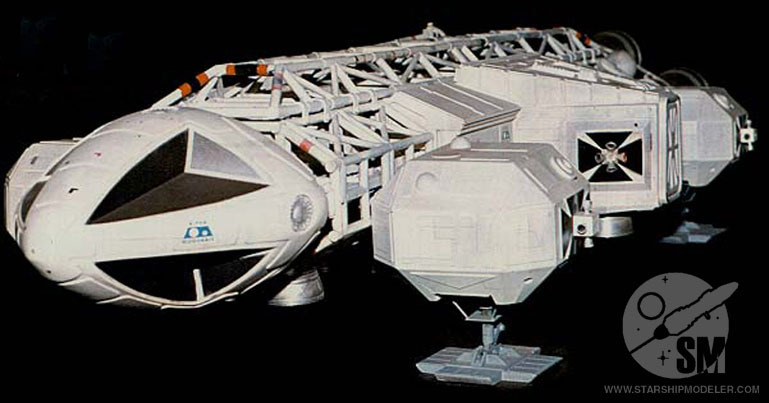 The Swift was a class of exploration craft launched from Earth. This ship is seen the in second season episode, Brian the Brain. It is one of four Swifts that took off from Earth in 1996, along with a mothership, on a mission which disappeared without trace. This ship is not the same as the Super Swift, from the episode Bringers of Wonder. 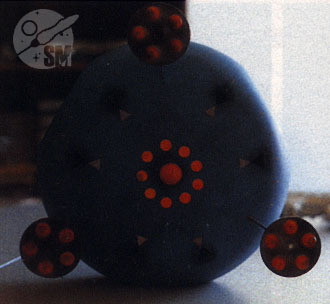 Image 1: Bottom view of model. Image 2: Top view of model. Image 3: High angle picture in hanger bay. Image 4: Low angle shot inside hanger bay. This alien vessel intersects Alpha's path. Inside are a number of humanoids in suspended animation who are refugees from the doomed planet of Kaldor. They are headed to Earth and as fate would have it, they have room for one more passenger. That's where the fun begins in the season one episode Earthbound. The gourd-like design of this ship demostrates a remarkable departure from the crisp, functional design of Alpha's hardware. 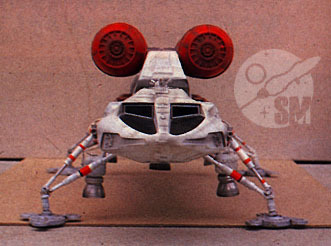 Space: 1999 characters and images are copyright ITC Entertainment. This page is best viewed by a system carrying the 'Haettenschweiler' font. Please direct comments, questions, corrections, and picked nits to the Starship Modeler staff. 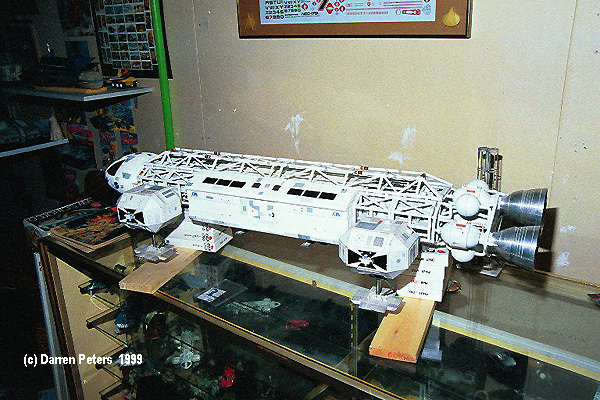 This page copyright 1999-2015, Starship Modeler. Last updated 26 February 2015.